Superman 64 sucked. Superman Returns was bad. I've read plenty of great Superman comics, but, until yesterday, I never played an excellent Superman game. Yesterday morning, I didn't even know a new Superman game was coming out. It is. It's on the iPhone and iPad, but don't dismiss it for those reasons! 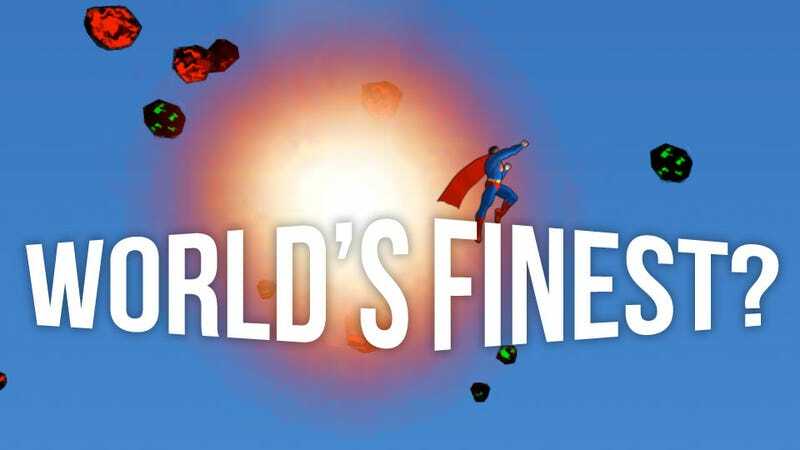 It's the best Superman game I've ever played. The problem with Superman games is that they are clumsy, dull or simply don't feel right. Superman has very few weaknesses, so casting him as the standard gaming hero who can be killed and respawn doesn't work. Limiting his powers so that players can learn just to fly or punch doesn't work. Making him beat up hordes of bad guys by blasting them with heat vision just doesn't feel very Supermanly after a while. The Man Of Tomorrow isn't supposed to be a bully or a wimp and the years have shown that maybe he shouldn't be a video game character. But this new game, which I played a few levels of at an EA/Chillingo event yesterday, works. Superman feels powerful and purposeful. He comes off as a protector and hero, not a violent creep. He seems like a great hero, as he should. The game, which is simply called Superman, is in 2D. It's set in Metropolis (mostly) and, in the levels I played, Superman is invincible. His problem isn't pain; it's time. Each level is a race against the clock to get Superman to stop robbers, punch out flying villains, smash getaway cars, blast space invaders with heat vision, blow out fires with his super-breath and more. This all takes place across one massive level that stretches out beyond the scope of an iPhone screen, allowing Superman to run across a long stretch of Metropolis' streets, buzz up to the skyline or even, smooth as can be, crack the atmosphere and bolt into outer space. The game's Metropolis level scrolls in any of those directions, wherever you send Superman to save the day. Brilliantly, the entire Superman experience is simplified to just three inputs. You will feel very powerful, as being Superman should. With your left thumb, you move Superman around the screen... running, flying, whatever makes sense for where he is, on the streets of Metropolis or in the sky above (or, if you fly high, up to outer space above that). You'll have two virtual buttons under your right thumb. One represents speed; one represents superpowers. Both are context-sensitive, so if you have Superman flying across the level, pressing the speed button stretches his posture into a Christopher Reeve fist-forward streak of red and blue. Press that same button when he is on the ground and he'll run super-fast. The power button, also context-sensitive, triggers super-breath if Superman is near a fire, heat vision if he is far away from enemies, and super-punches if he is close to the bad guys. The screenshots included here don't do the game justice. The game animates beautifully, with Superman standing barely a finger-nail tall as he fluidly zips past skyscrapers to tussle with airborne enemies. The levels I played were full of delightful, attractive surprises. When I flew down to a getaway car, my angle was just right to cause the Man of Steel to pounce on the top of the car and smash it to a halt. An instant later, I had him picking up a car tire and hurling it at some runaway robbers. The character animation, the scrolling of the level, the dynamism of the action... these don't come through in screenshots. The game is broken into levels that each task the Man of Steel with having to deal with several waves of problems in Metropolis, the waves capping with some larger threat like a strike from a massive missile. A menu screen showed more than two dozen levels, and while the action could become repetitive, the fundamentals are excitingly strong. As shocked as I was to hear that there was a new Superman game, I was more stunned that it is written by Grant Morrison. Morrison is not simply my favorite comics writer but one who is generally considered a giant in his field. His All-Star Superman series and his new re-launch of flagship Superman book Action Comics are both highly acclaimed. I could hardly imagine what he'd lend to an iPhone game, and it may not be much. I was told that he's responsible for the game's set-up, which has Lex Luthor launching a satellite in space to remedy climate change. Superman doesn't buy that, and the story goes from there. The developers of the game who are much more responsible for the quality of the game I played are called Tiger. I'm not familiar with their work. I know, I know, this is a Superman game. But, trust me. As unlikely a statement as this is, I'm recommending you add Superman for iOS to your watch list. Really. It should be out later this fall or winter and I think you'll like it. Oh, and if it matters to you Superman fans out there, Luthor wears his green armor in this game.